It was apparently actor George Woodbridge who suggested the idea of filming Prince Felix Yusupov's memoir Lost Splendour to Hammer producer Anthony Hinds in 1961. 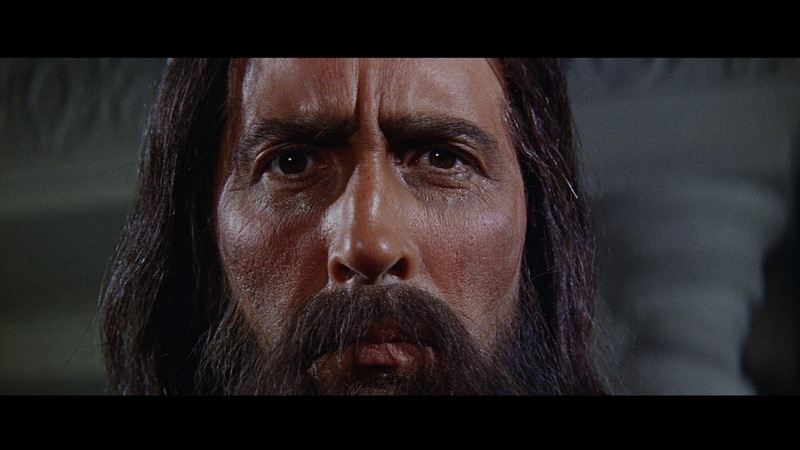 However, it wasn't until Christopher Lee returned to Britain from his Swiss tax exile in the summer of 1965, and back to making films with Hammer on a regular basis, that the project was scheduled to be made. 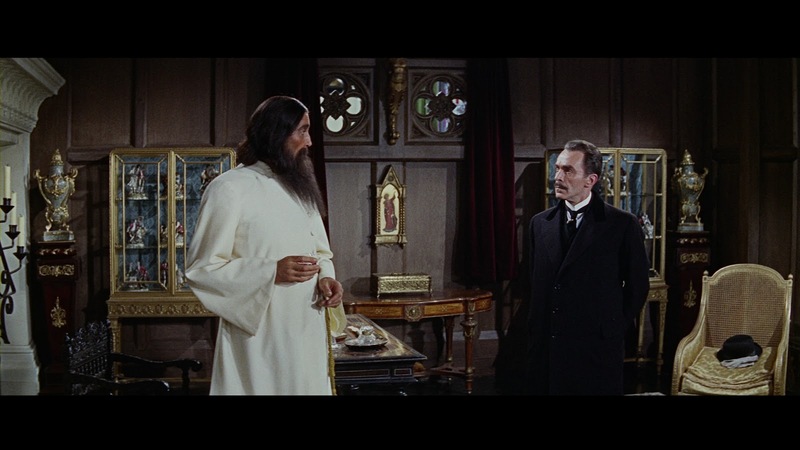 Rasputin the Mad Monk was essentially the carrot dangled to Lee to persuade him to sign a contract to play Dracula in the film that would be made back-to-back with Rasputin at Bray Studios, Terence Fisher's Dracula Prince of Darkness. For Hammer, the development of the script was of immense concern. They were probably aware of the law suit brought against MGM in 1933 by Princess Irina Romanoff Yusupov who claimed the film Rasputin and the Empress had invaded her privacy and had erroneously portrayed her as Rasputin's mistress. She won a settlement in an English court in 1934 and received an out-of-court settlement from MGM the same year. Felix Yusupov also sued CBS for $1,500,000 in a New York court in 1965 for broadcasting a play about Rasputin's assassination in 1963. His claim was that some events were fictionalized and that, under a New York statute, Yusupov's commercial rights in his story had been misappropriated. CBS eventually won the case. It's not known if Hinds had the legal complexities in mind as he put the first draft of the script together because he took great pains to base the script on Yusupov's own memoirs. However, Yusupov's estate were soon in contact, issuing a letter warning Hammer of the outcomes of misrepresentation, and Hinds duly revised the script completely, changing events, names and familial relationships and ejecting a number of characters to comply with Yusupov's wishes. Hence, Yusupov was transformed into Francis Matthew's character Ivan Keznikov and details about Rasputin's relationship with Alexandra, the wife of Nicholas II, Tsar of Russia, the healing of their son Alexei and Rasputin's influence over the court were either drastically altered or completely abandoned in the final script. Certainly, the role of Tsarina Alexandra was reduced significantly, leaving Lee's co-star Renée Asherson rather unhappy when she came to film her scenes. Hammer, to avoid any possible future litigation, requested that Yusupov sign every page of the finished script. To make absolutely sure, the opening page of The Mad Monk, as it was then known, clearly stated: 'This is an entertainment, not a documentary. No attempt has been made at historical accuracy... all the characters and incidents may be regarded as fictitious.' (1) It's as well to bear that in mind watching Rasputin the Mad Monk. 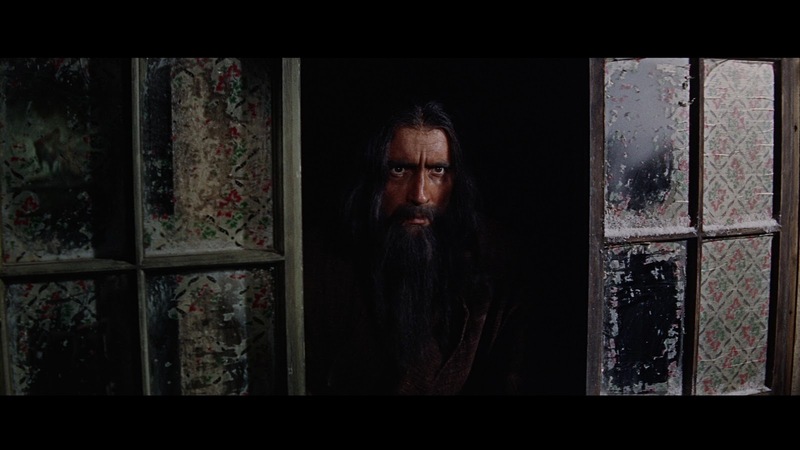 Hinds' story therefore concentrates on Rasputin's humble origins as an outcast healer in Tsarist Russia, banished from a monastery for his violent, sexual behavior and unorthodox supernatural skills. He arrives in St. Petersburg and in a local cafe meets the drunken Dr. Boris Zargo (Richard Pasco, who had a strong leading role in 1964's The Gorgon) and is enmeshed in the social circles of the Russian court. It is represented by Sonia and Peter Vasilivitch, Ivan and Vanessa Keznikov (played by the supporting cast of Dracula Prince of Darkness - Barbara Shelley, Francis Matthews and Suzan Farmer joined by Dinsdale Landen as Peter). When Rasputin discovers that Sonia is the Tsarina's lady-in-waiting, Rasputin seduces and hypnotises her, ordering her to injure the Tsar's child and effect his entry into, and influence on, the royal Russian household. Assuring Trevelyan that discretion would be adhered to, Nelson Keys was keen to get the production underway as Dracula Prince of Darkness was about to complete shooting on 4 June and Rasputin would commence, initially on location in Black Park and then after using the same sets on the Bray backlot, from 8 June. 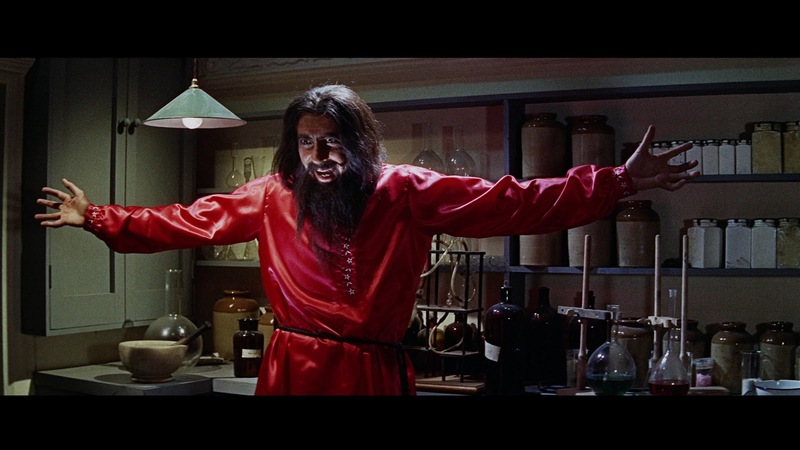 Fresh from his success on other Hammer films, including Kiss of the Vampire (1962) and The Devil-Ship Pirates (1964), and Anglo-Amalgamated's lush period version of The Face of Fu Manchu (1965), also starring Christopher Lee, Australian director Don Sharp was invited to bring Rasputin to the screen. 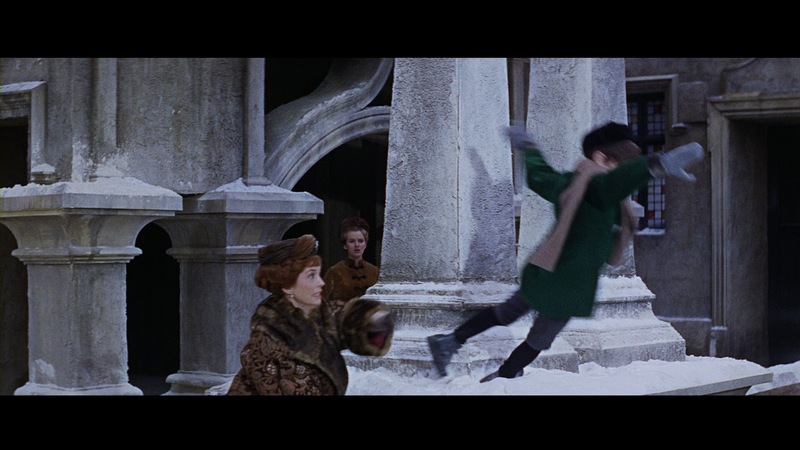 Bernard Robinson and his art director Don Mingaye revamped the Castle Dracula frontage to stand in as the exteriors of Ivan Keznikov's house, reusing the frozen moat, in which previously Dracula had perished, and now where Sonia would injure Alexei and Rasputin would eventually plunge to his death. Stage 2 housed the cafe (originally Dracula's cellar) and the St. Petersburg market (fomerly the courtyard of Shandor's monastery) and, on the other stages, the interiors of Rasputin's villa, Keznikov's house and the Tsar's palace were handled by Robinson with his usual penchant for revamping and recycling sets. 'Robinson characterised himself as the "Marks and Spencers" of art direction, someone who provided value for money' and, despite the prevailing lack of budgets, Robinson's time working at Bray saw him at the height of his powers. 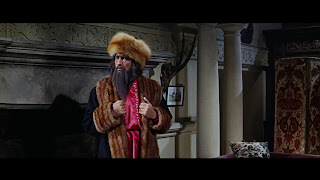 (4) However, Rasputin was a victim of budgetary problems, wherein scenes at a ball and the Tsar's court were either scaled down or jettisoned altogether, despite securing Renée Asherson to play the Tsarina. 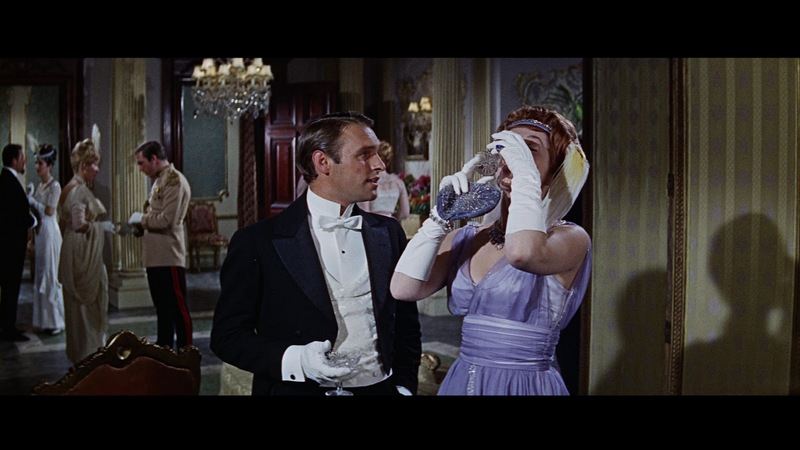 The opening of the ballroom scene ended up using a stock shot from 1956's Anastasia rather than go to the expense of building sets and employing extras. Lee characteristically spent much time researching the role, as Francis Matthews attests to in both the commentary and the documentary on this disc, and worked closely with director Don Sharp on his performance. 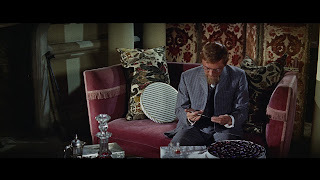 His determination to play the part truthfully also reportedly saw him consulting a number of medical experts about the effects of cyanide poisoning for the climactic scene where Ivan and Zargo tempt Rasputin with deadly chocolates. 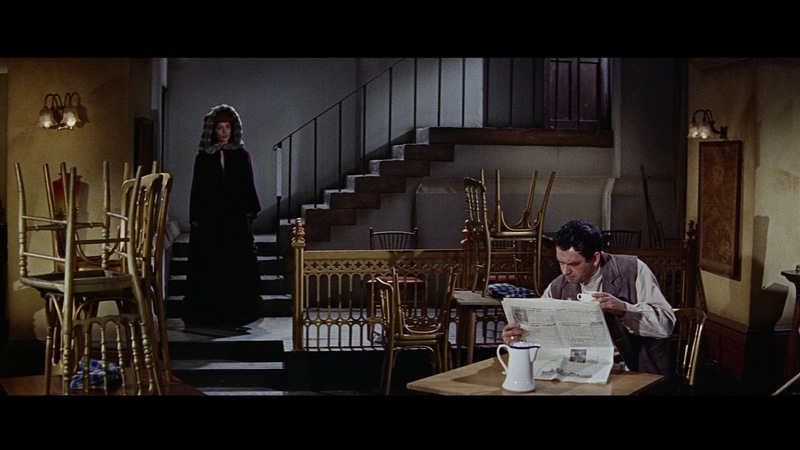 Later, Francis Matthews was rather disgruntled when most of this sequence ended up being cut out of the film, possibly because of pacing as Denis Meikle postulates in the documentary on this disc. It did, however, leave the continuity of the scene in something of a disarray and the film with a rather truncated ending. 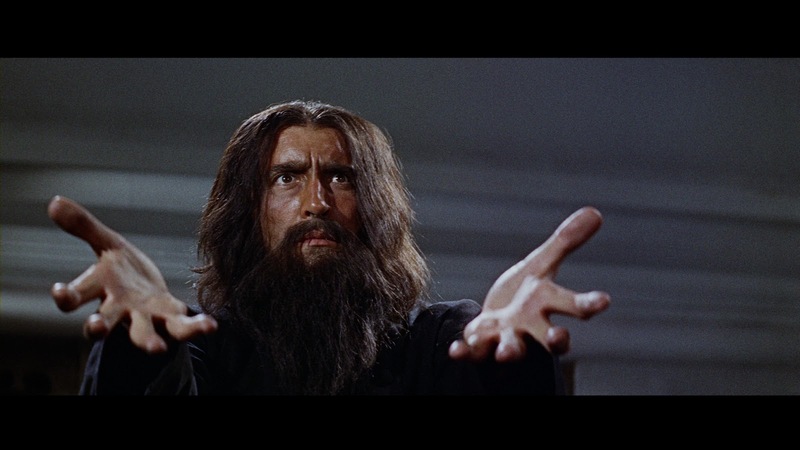 Lee also filmed an extension to his demise on the icy moat, showing Rasputin with his hands held to his forehead in benediction. Allegedly, it was deemed unsuitable on religious grounds and was removed from the film. The BBFC still required their pound of flesh and a black and white print of the film was submitted to them on 19 August, almost a month after principal photography had been completed. 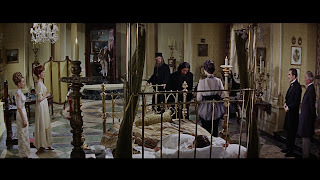 John Trevelyan was still bothered by the severed hand and wanted it out of the film, concerned by the scene depicting Rasputin's seduction of Sonia and her fight with him ('we certainly want you to remove all shots in which the flask of acid is near her face'). He was also worried about the acid attack on Peter and Rasputin's vomiting and retching after eating the poisoned chocolates ('could you not replace this by moans and groans?). 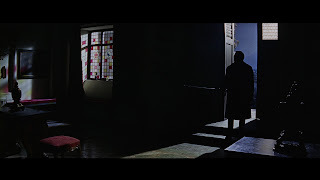 (8) Nelson Keys stood his ground and the debate over these scenes continued until 28 October when the film was finally granted an X certificate after various edits had been agreed. The film went on release 6 March 1966 on a double bill with John Gilling's The Reptile. It remains something of an under rated film in Hammer's catalogue with many critics rather unfairly attacking the film's low budget and sparse settings. 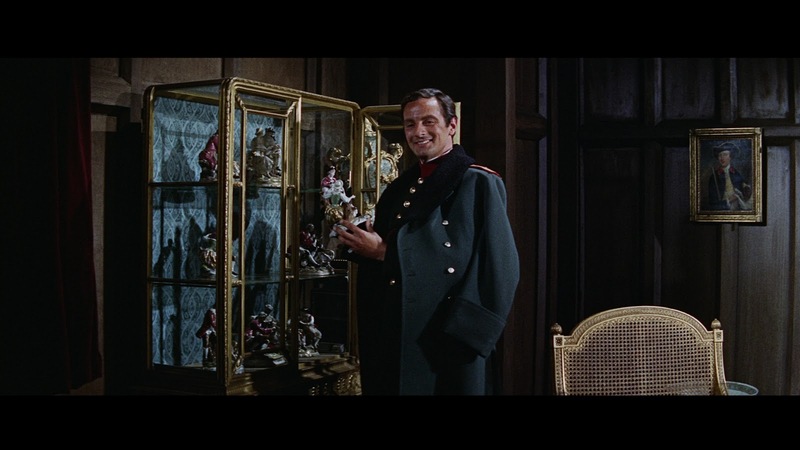 Granted, most of the film does take place indoors and only the Black Park locations, the rather limited views of the St. Petersburg market and the exteriors of Ivan's house punctuate a film that emerges from dingy cafes, tatty apartments and opulent palaces and villas. However, there's something of an injustice being perpetrated here. The restrictions become a virtue and Don Sharp and his cinematographer Michael Reed, who had just shot the equally luscious looking Dracula Prince of Darkness, introduce a schematic of picking out areas of the sets with delicate pools of light, to highlight certain characters, to suggest their psychological states and to generate a particularly intense atmosphere. 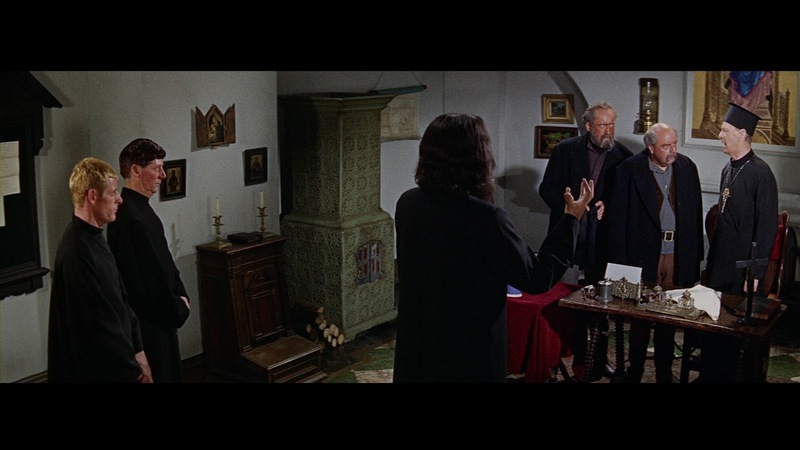 This is evident right from the opening scene when Rasputin arrives at an inn to heal the sick wife of the landlord and, as he begins the laying on of hands, faces emerge from the gloom and the praying landlord is bathed in a halo of golden light. It's a lighting scheme that Reed manipulates to greater effect later when Rasputin arrives in St. Petersburg and meets Dr. Zargo. Bernard Robinson's cafe set allows Reed and Sharp to use lighting to both isolate the various customers, presenting Rasputin and Zargo as tableaux vivant, and highlight areas of the cafe. He also puts it to good use whenever Lee has to indulge in Rasputin's hypnotic ability (there's a wonderful moment where Rasputin's face emerges from the shadow of a window and he glares across the rooftops to ensnare Sonia), when he's fighting off Sonia (the lighting on Lee and Shelley is superb) and in the superbly atmospheric stand off with Peter which is illustrated as a series of faces drawing back and forth from the shadows. At the centre of the film is a monumental performance from Christopher Lee that allows him to use all his physical attributes, including his eyes, his huge and incredibly expressive hands and that deep bass voice. He almost dominates the film and, where it not for the effective performances from Shelley and Pasco, he would completely own it. Barbara Shelley is quite wonderful as Sonia, both sensitive and sensual and certainly matching Lee for physicality in their fight together. 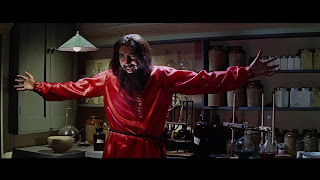 Richard Pasco provides the moral centre of the film and, as an alcoholic doctor struck off from practice slowly engulfed by Rasputin's influence, he shows how a buffoon gradually finds the courage to understand how thoroughly manipulative and corrupting a creature he is. Sharp also manages to leaven Lee's brooding intensity with some rather welcome moments of comedy. The drinking contest is another example of Lee's ability for physical performance and mimetic skills and Richard Pasco joins in the fun by falling down drunk after attempting to dance. He also punctuates this with scenes at the ball where Sonia necks back the champagne, proving she's a bit of a good time girl, before she, Peter, Ivan and Vanessa decide to head downward socially and join the working classes for a bit of entertainment at the cafe where, as Ivan puts it, 'someone always gets drunk and starts fighting'. 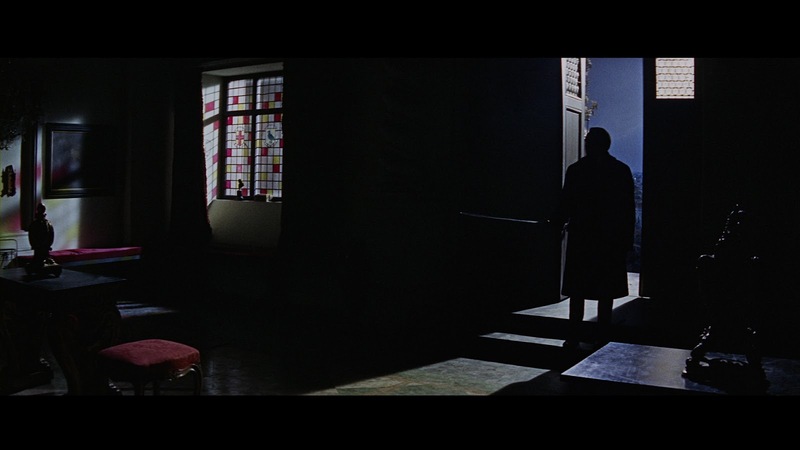 Reed's visual scheme also works in close relationship with Robinson's sets and you can clearly see various symmetries in the film, where characters are caught in physical space, in moral limbo perhaps, because of their inability to challenge Rasputin's influence over the Romanov family. 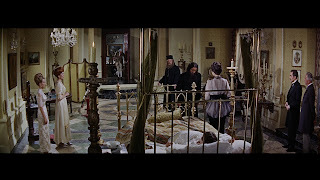 It is expressed perfectly in the scene at Alexei's bedside with shots that arrange various figures in the drama to the left and right of the screen, and the child's bed, and then place Rasputin directly in the centre. 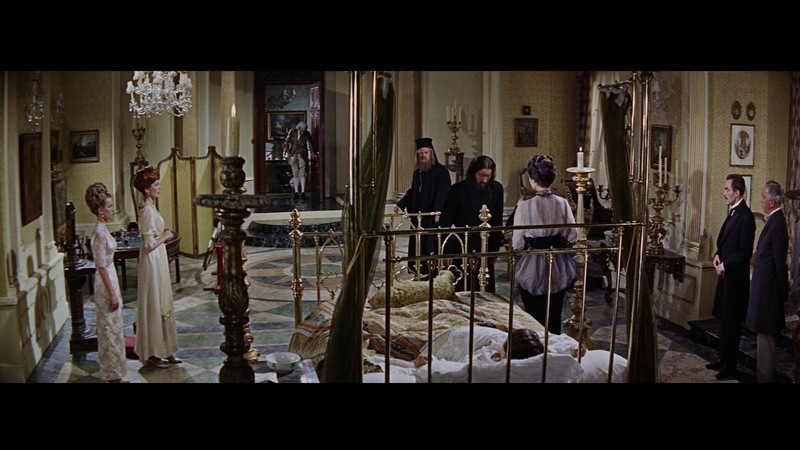 Robinson's settings offer the film up as a strategy, where Rasputin's ambitions as personal healer to the Tsarina leave the tragic demise of Sonia and physical injury to Peter in their wake. The couples in the film, pairs of brothers and sisters, Rasputin versus the court's rational and religious figures Dr. Zieglov (John Bailey) and the Bishop (Joss Ackland), are therefore equally part of this symmetrical pattern. 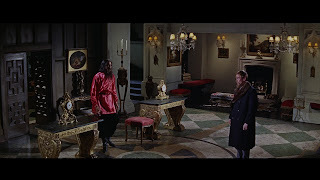 When Ivan baits Rasputin to attend a clandestine meeting with his sister Vanessa, the ornate cabinets and figurines that Ivan handles and examines are highly symbolic of the pawns in this strange game of chess and Ivan's need to negotiate Rasputin towards his own demise. Unfortunately, Rasputin's ambitions and influence on the Tsarina are not particularly well articulated. 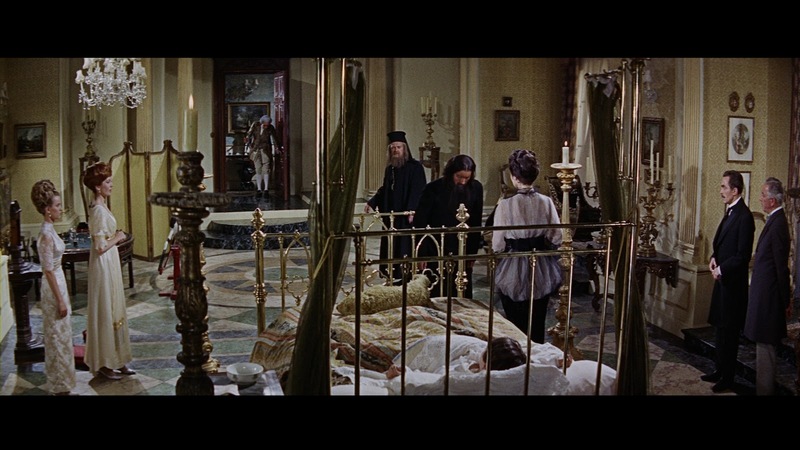 The court and the Tsarina disappear from the film and the narrative devolves into a straight forward battle between good and evil. The political intrigue of the story is abandoned after about an hour, leaving the last thirty minutes to the downfall of Sonia, with Shelley letting rip in her performance and the superbly filmed clash between Rasputin and Peter, given typical Hammer horror touches by Peter's disfigurement with acid. All wrapped up in a Don Banks score full of doom and portent, there is plenty to enjoy here, from Lee's rambunctious performance and Shelley's ability to give Sonia vulnerability and a sense of tragedy to Reed's gorgeous looking images, Bernard Robinson's sets and the requisite horror of severed hands and burnt faces. A neglected gem. Quite stunning. There is incredible depth to this transfer (for both ratios) and a marvellous texture from the grain that gives this a truly film like appearance. 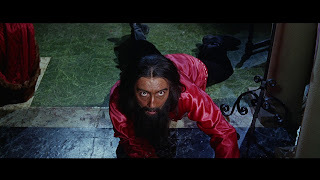 Deep layers of black dominate the image (Rasputin's challenge to Sonia's brother Peter takes place in small pools of light and looks incredible), there is plenty of detail in costumes and faces and spectacular reproduction of colour. Check out Rasputin's red silk cossack shirt, Sonia's purple cloak, the uniforms and dresses and the close ups of faces and you'll be rewarded with plenty of colour, detail and depth. 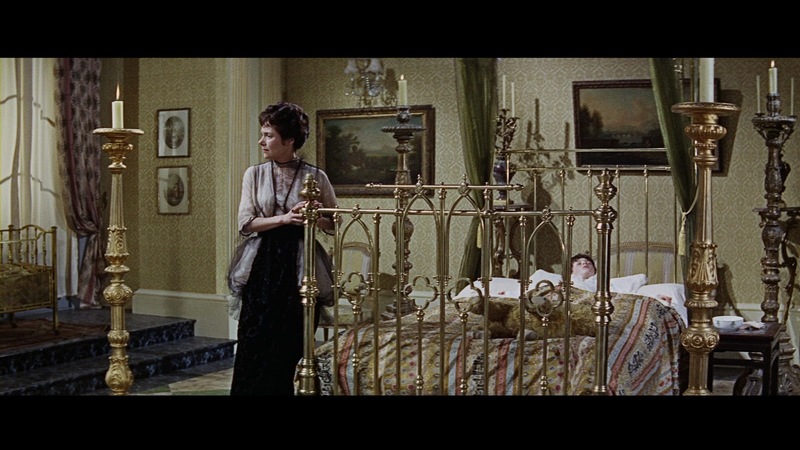 The restoration also showcases the production design. 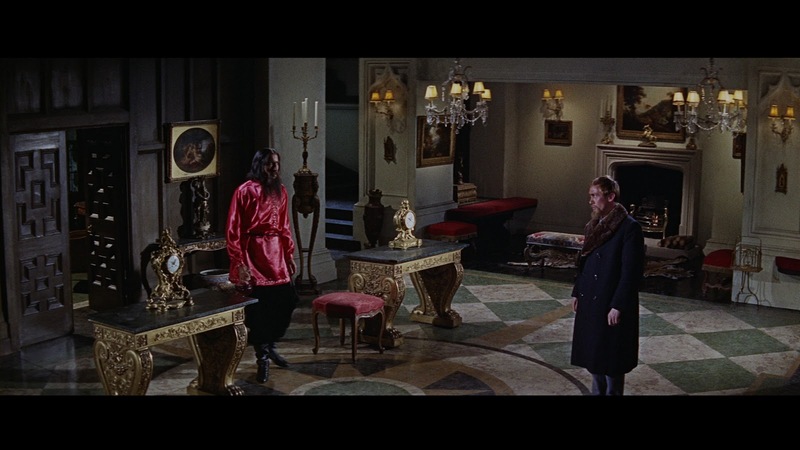 Bernard Robinson's sets look amazing, particularly Zargo and Rasputin's apartment, Tsarevich Alexei's bedroom and the interiors of Rasputin's villa, and Michael Reed's master shots, which capture their full detail, symmetry and colour, look very impressive here. If there is a downside, then it is the audio on this disc. After considering there were issues with the opening titles and score, sounding very thin and tinny, and accepting that the rest of the film's sound was passable I consulted the Optimum DVD release in the Ultimate Hammer Collection. The audio reproduction on the DVD is fuller and richer overall. There is something not quite right with the audio on the BD, requiring you to turn the volume up to get any decent depth out of the track and it sounds thin in comparison with the DVD. 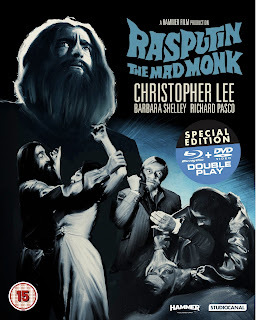 Lee clearly knows his stuff about Rasputin, researched the part in some depth at the time, and here offers up a wealth of information about Rasputin's life and times. He apparently met two of the alleged conspirators, Prince Yusupov and Grand Duke Dimitri, when he was a child and discusses previous film versions and Yusupov's law suits against film companies intending to film Rasputin's story. The track can often fall into short periods of silence but when it is in full sway it is very entertaining and informative. A fascinating and welcome addition for those of us curious to see what the film would look like at its 2.55:1 ratio. 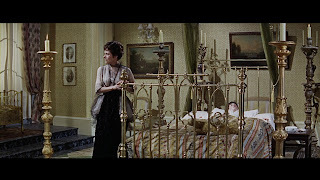 The film was shot using anamorphic lenses that squeezed a 2.55:1 image into a standard 1.37:1 frame and it was always intended that it would be matted and screened at 2.35:1, losing picture information at the left and right of the frame. The use of these lenses produces the fish eye, concave effect on the picture that can still be detected on the 2.35:1 version but is more evident in the 2.55:1 version, particularly when director of photography Michael Reed pans his camera left or right across the frame. You'll also notice that any figures at the extreme right and left tend to get squashed and look taller and thinner than their counterparts in the centre of the frame. 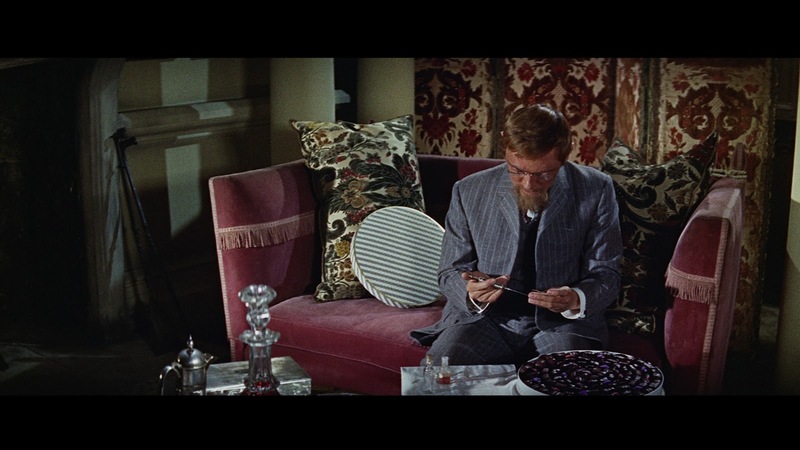 As the on screen note indicates, with the 2.55:1 ratio you do get a greater sense of the symmetry in Bernard Robinson's production design and the results of what must have been a close collaboration with Reed. Another fascinating exploration of the film's origins with Denis Meikle, who recounts actor George Woodbridge's suggestion to Hammer that they adapt Yusupov's book Lost Splendour and how the film fitted into the then penchant for epics and was an extension of Hammer's own historical genre pictures, and where Jonathan Rigby highlights some of the Hammer horror credentials of the film and its re-use of the Dracula Prince of Darkness sets and locations. Andrew Cook, author of To Kill Rasputin, identifies the characters in the film with their historical counterparts, sorts out the historical fact from the fiction about Rasputin ('he was neither mad, nor a monk'), the myth of Rasputin's death created by Yusupov and the reality that he was assassinated by British Intelligence to prevent a German peace initiative. The documentary then shifts to Lee's portrayal of Rasputin and both Barbara Shelley's praise for her friend and Francis Matthew's respect for him as a dedicated actor. We also learn of Francis's impressions of Eric Morecambe, about his idol Robert Donat and meeting Donat's wife Renée Asherson on Rasputin the Mad Monk. Finally, David Huckvale, author of Hammer Film Scores and the Musical Avant-Garde, waxes lyrical about Don Banks' score for the film and Denis Meikle discusses the cuts made to the film, particularly the missing fight scene. This all makes for an informative and entertaining supplement to the film from the Hearn and Sherwood team. A delicious wallow in nostalgia as this brief featurette looks at the tie-in novels and novelisations of Hammer films that began with Spaceways in 1953. Rigby and Mark Gatiss take us through the back catalogue, from the novelisations of The Camp on Blood Island and Revenge of Frankenstein to the Phantom of the Opera. There is a brief look at the books issued by Sphere and Fontana in the early 1970s and Gatiss rightly points out that the novelisations were the only way that you could relive the horror films featured in late night slots in the ITV regions or in the BBC's summer double-bills that began in 1975. Writer John Burke is appropriately lauded for his effect on horror obsessed teenage lads of the 1960s and 1970s and Rigby traces the publication of Burke's omnibuses in 1966 and 1967 which adapted a number of classic Hammer films. Author Johnny Mains takes up the story of Burke's involvement and provides a very moving little tribute to a writer, a reputable horror anthologist, he was lucky to work with. Finally, the Hammer publishing story is brought up to date with the latest imprint in association with Arrow which has seen the issue of new novelisations of Hammer films and original horror novels. A trot through Hammer's historical 'epics' with Oliver Reed, who even disses his own performance in The Brigand of Kandahar, covering everything from The Stranglers of Bombay and The Pirates of Blood River to The Sword Of Sherwood Forest and, yes, even some clips from John Hough's Wolfshead before we get to The Scarlet Blade. No audio problems on this episode, thankfully. Selection of posters, trade ads, pressbooks, full colour lobby cards, publicity stills (shots of Renée Asherson larking about with a brolly are amusing and some coquettish Hammer glamour snaps of Babs Shelley are rather wonderful), and behind the scenes photographs showing director Don Sharp and the crew at work.